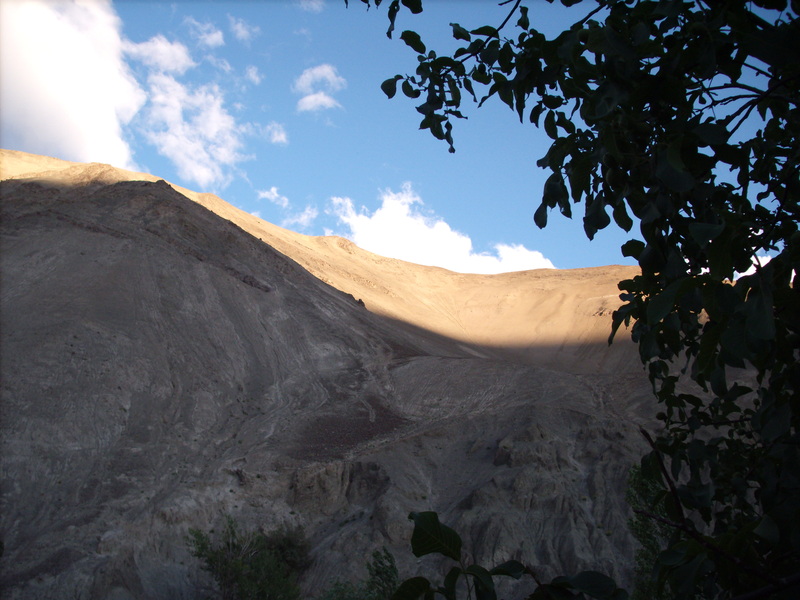 6/28/08 – Beware eating raw food in India – even in Ladakh. As I mentioned previously, I had a bad case of Delhi Belly – I was feverish, nauseous and had digestive issues all night, such that I “slept” on the bathroom floor… Needless to say, I was a little under the weather for both of these gorgeous monasteries. However, we started our trip to Lama Yuru monastery on this day, so I guess I “picked” a good day to be ill – most of it was in the car. Lama Yuru is a solid seven(?) hour plus drive away from Leh, so we visited a couple of monasteries and then planned to stay at a guest house mid way. The road from Leh to Lama Yuru is a little… hhmmm… how do I put this? fragile? There were some places where either A) sand had blown over the road for at least half a mile, obscuring it completely or B) there was no road and the jeep tracks through the desert were normal… Yeah. I was beginning to wonder where we were going – and why there was not a road there. I was quite ill so I walked around part of the monastery and then went and waited in the car (near the latrine). I did not go in at all to Alchi Monastery which was next on our list. But I later read a beautiful (illustrated) book about it in Leh when I was on my own – I visited the local library and found their collection quite nice, if small. However, Alchi is presently a Gelugpa monastery. Although there are stories about it being named after the Drikung protector deity / female Buddha Achi – as in Achi Chokyi Drolma. Sometime in the past few centuries it came under the Yellow Hat influence. It is known as having some the oldest Buddhist art in Ladakh – no photography is allowed in the main hall. The influence of Kashmiri and Muslim artists can be seen in its art work. There are tall statues of Manjushri and I think Avalokitesvara – every square inch of which is painted with intricate, little depictions of the Buddha’s lifestory or the Jataka tales, etc. I am in search of the fresco that you have captured a touch of in one of your attached images! Which monastery was this fresco? I re-painted an image of him – I believe it’s Guru Dragpo. You can see the image I am referring to at http://www.gurudragpoproject.wordpress.com. Your blog appeared in a search for Stakna monastery. 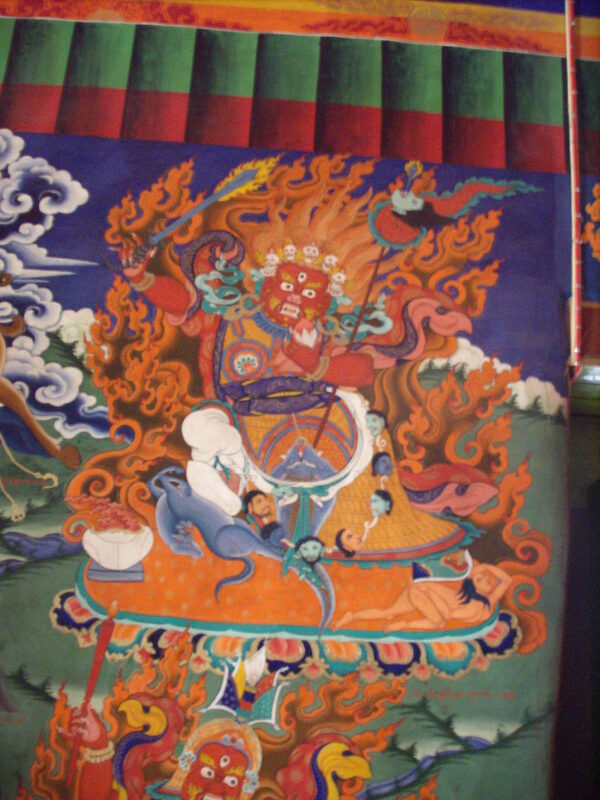 Is Stakna where this wrathful deity image can be found?